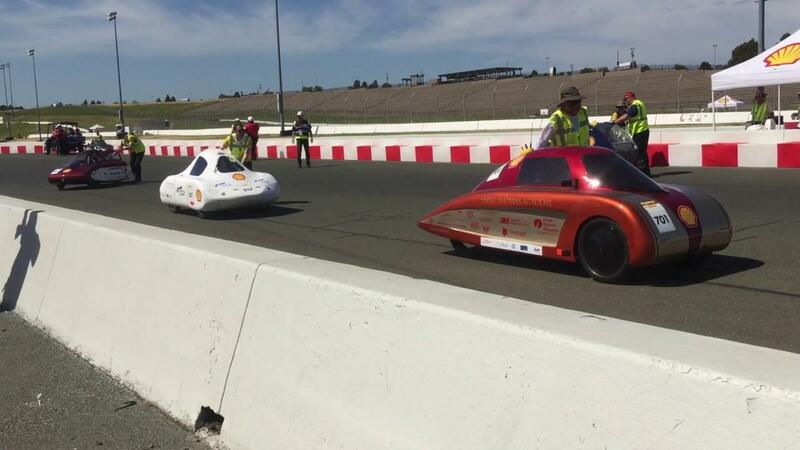 Some of the fuel-efficient vehicles that competed for "world's most energy-efficient vehicle" at the 2018 Shell Eco-Marathon at Sonoma Raceway. They'll join California students from Cal Berkeley, Cal Poly, UCLA, Loyola Marymount and Schurr High School in Montebello. Shell says this year, nearly a quarter of the participants identify as female, marking the largest proportion for the event to date. That includes this college senior. BAEZA: "We can do anything the guys can do." That's Maria Baeza [bay-zah], one of three women representing Sac State. Their vehicle uses gas; but diesel, ethanol, hydrogen, and electric batteries are also part of the competition. Baeza says she likes seeing younger girls encouraged by her work. It's similar to the motivation she's had in past years at the competition. BAEZA: "Some of the techs who inspect our cars are women as well, so that like pushes us, like I can be there with them, you know." Teams that can go the farthest using the least energy will qualify for the world championship in London this July. Last year, Brigham Young won the gas-powered division with fuel efficiency of nearly 2000-miles-per-gallon. In Sacramento, I'm Randol White. Governor Jerry Brown has issued an executive order to boost the number of zero-emission vehicles on California roads. Capital Public Radio's Ezra David Romero reports. Californians tend to buy larger, gas-guzzling vehicles, IF their other car is a fuel-efficient model. As Capital Public Radio's Randol White explains, researchers compare the trend to the diet soda effect.